Use the Kestrel friendly clamp (also available separately) to accommodate any Kestrel model. Or remove the tripod clamp to attach the Vane Mount. Weighing only 1.7 pounds and collapsing to a compact 14 inches high. Enjoy the durability in this piece of Kestrel equipment. 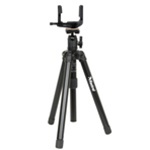 This tripod is the perfect companion on any trip!